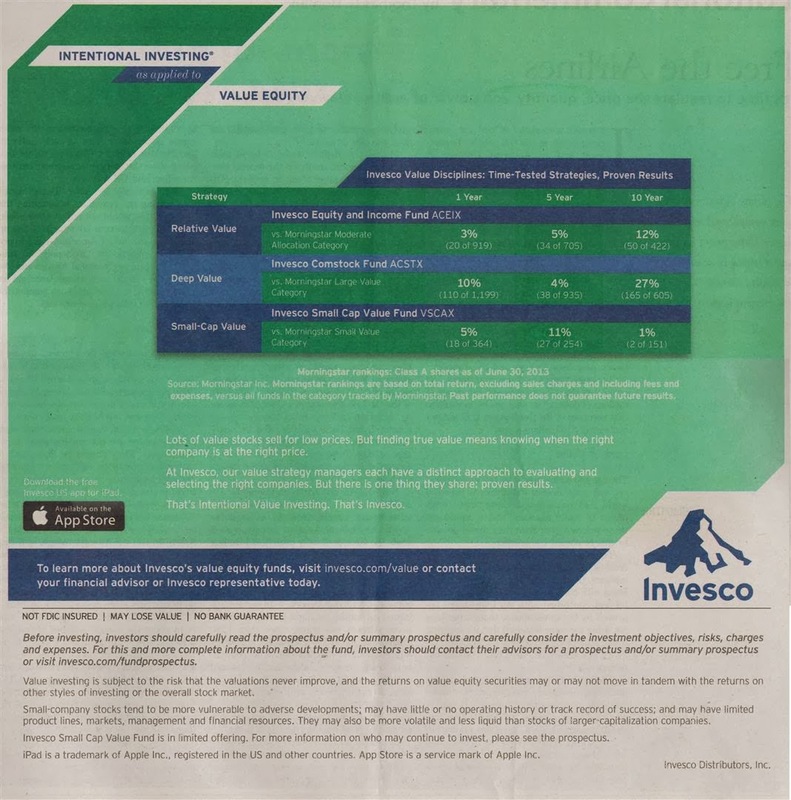 Find Invesco Value Equity Funds review. The mutual funds are Invesco Relative Value Fund, Invesco Deep Value Fund, and Invesco Small-Cap Value Fund. Whether you follow Ben Graham or Warren Buffet strategy, value investing is popular among investors. Value investing concept is done by finding companies trading below their value or worth. Investor will looks for stocks with strong fundamentals such as earnings, book value, and cash flow that are selling below its value. Regular investors may be difficult to choose the right value stocks. Using mutual funds may be easier and less risky. 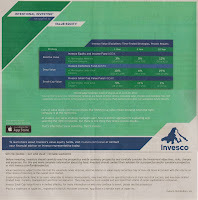 Recently, Invesco provides an ad about value equity mutual funds. The ad title is “Intentional Investing: as applied to Value Equity.” It provides 3 mutual funds for investing. Find the fund review below. Should you invest in these mutual funds? Whether they are for your brokerage account, retirement account (IRA), or 401k plan, you need to find the funds details. Source: Morningstar Inc. Morningstar rankings are based on total return, excluding sales charges and including fees and expenses, versus all funds in the category tracked by Morningstar. Past performance does not guarantee future results. Lots of value stocks sell for low prices. But finding true value means knowing when the right company is at the right price. At Invesco, our value strategy managers each have a distinct approach to evaluating and selecting the right companies. But there is one thing they share: proven results. That’s Intentional Value Investing. That’s Invesco. Download the free Invesco US app for iPad. Available on the App Store. To learn more about Invesco’s value equity funds, visit invesco.cm/value or contact your financial advisor or Invesco representative today. This Invesco fund was introduced to public in August 1960. This Invesco Equity and Income Fund is currently managed by Thomas Bastian, Chuck Burge, Mary Jayne Maly, Sergio Marcheli and James Roeder. The fund seeks the highest possible income consistent with safety of principal. The secondary investment objective is long-term growth of capital. This stock fund has total net assets of $12.3 billion. It utilizes it assets to purchase in income-producing equity securities (including common stocks, preferred stocks and convertible securities) and investment grade quality debt securities. It has a dividend yield of 1.92%. The fund has expense ratio of 0.80%. This equity mutual fund applies Large Value investment style. Morningstar analysts rank the ACEIX fund with Bronze and 4-stars rating. The YTD return is 20.73% and it is on the 2nd rank among its peers in Moderate Allocation category. This fund recorded 41 years of positive return and 11 years of negative return. The best 1-year total return was recorded in 2009 with 23.51%. The top 5 stocks as of September 2013 are JPMorgan Chase & Co (2.83%), Citigroup Inc (2.22%), General Electric Co (2.00%), Viacom Inc (1.77%) and Avon Products (1.64%). Investment objective of the Invesco Comstock Fund is to seek capital growth and income. It also invests in equity securities, including common stocks and securities convertible into common and preferred stocks. The dividend yield is 1.25% and is distributed quarterly. It also has total net assets of $11.2 billion. The minimum initial investment needed is $1,000. The top 3 holdings are Citigroup Inc (4.00%), JPMorgan Chase & Co (3.10%) and Viacom Inc (2.61%). The top 3 industries are Pharmaceuticals (10.06%), Other Diversified Financial Services (8.66%) and Integrated Oil & Gas (8.51%). Managed by R. Canon Coleman II, Jonathan Edwards and Jonathan Mueller, it seeks long-term growth of capital. The fund’s CUSIP is 00143M539. It has low fee of 1.12%. The average ratio in Small Value category is 1.38%. The total net assets are $3.1 billion. The class A has a sales load of 5.50%. The top sector breakdown is Information Technology (28.20%) and Financials (17.70%). The top holdings as of third quarter of 2013 are Belden Inc (3.52%), Manpowergroup (3.33%), Abercrombie & Fitch Co (3.15%), Etrade Financial Corp (3.05%) and Alere Inc (2.95%). Three of these value mutual funds are load mutual funds. Choose a no load fund for higher long term return. All these funds have great long term performance. If you can avoid the load, all have potential for great return.